This 500-piece jigsaw puzzle is designed by Rosiland Solomon and measures 16" x 20". 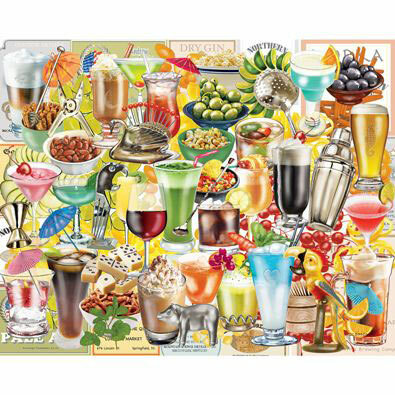 This puzzle depicts several different drinks, ready for happy hour. This 500-piece jigsaw puzzle is designed by Brook Faulder and measures 18" x 24". Three dogs sit down surrounded by a variety of treats.Available in two piece counts. This 500 piece jigsaw is designed by Christine Carey and measures 18" x 24". Everyone has gathered together by a campfire in the backyard under the stars and moon. Available in two piece counts. Waiting For Spring is a 500 piece jigsaw puzzle designed by artist John Sloane. A farmer and his dog gaze at the disappearing snow from the open door of the barn. Waiting and anxious to start sowing seed for the new seasons crop. Waiting Your Turn is a 500 piece jigsaw puzzle designed by artist Amy Rosenberg. Colorful birds perch on a branch above a group of kittens splashing in their birdbath. Pink and blue morning glories surround the base of the stone birdbath. This 500 piece jigsaw is designed by Rosiland Solomon and measures 16" x 20". Available in two piece count. Roundup is a 500 Piece Jigsaw Puzzle designed by Christopher Nick. A young boy relaxes on the steps of a porch, surrounded by his attentive dogs. He's taking a snack break before returning to his imaginary cowboy adventure. Available in two piece counts. This 500-piece jigsaw is designed by Rosiland Solomon and measures 16" x 20". A rooster stands ready to awaken the entire barnyard.